Twenty years ago, the world of video games took a monumental turn with the release of Super Mario 64 on the Nintendo 64. Gamers around the world had their minds blown after controlling their beloved Mario in 3d space for the first time. It was a landmark time for gaming and for many of us it brings back incredibly fond memories. Similar games followed in the years and generations to come, usually from Nintendo, but for Xbox games of today, the well has run a little dry. 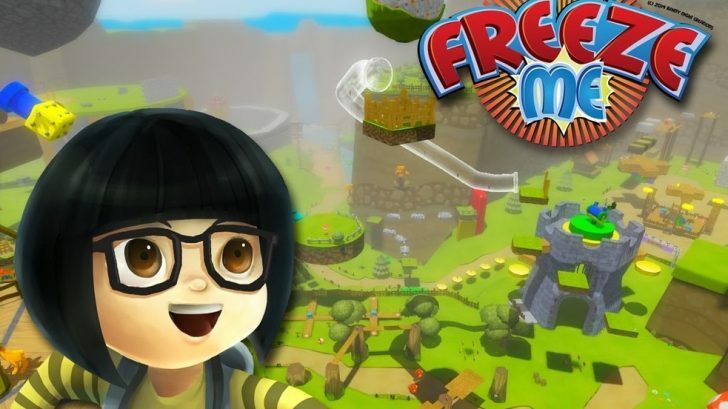 FreezeMe is a game that looks to capture the nostalgia of the Nintendo 64 era with open areas to explore, freedom of movement with spins, dives and jumps and replaying the same levels but with different objectives. FreezeMe has a lot of enjoyable moments but unfortunately suffers from similar problems that have plagued the genre from day one. The story in FreezeMe is quite outlandish, but I give it points for originality. Your main character is named R, and she’s a young girl with a special camera. One day the evil Fat the Cat kidnaps her best pal and dog, M, in an attempt to make a dog-free world. Thankfully R has a special tool at her disposal, a camera that temporarily freezes enemies; when frozen R can bypass enemies or attack them. 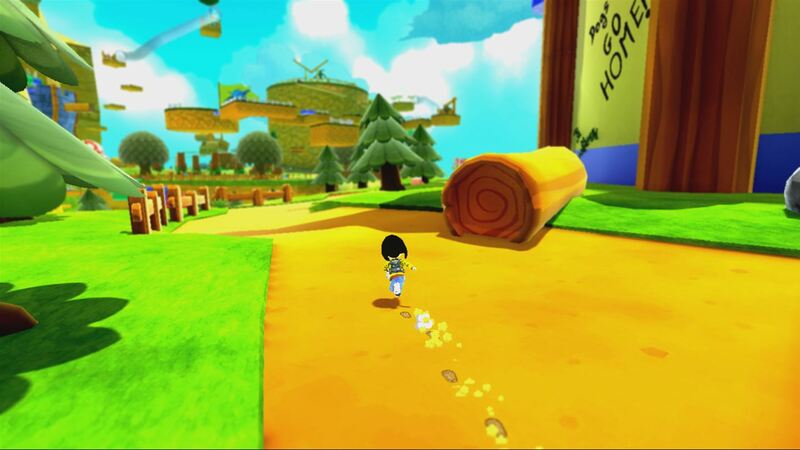 As you travel throughout the levels you will collect golden cubes which unlock new worlds. I felt like the story was just there and didn’t really feel any anger towards the games antagonist or real connection with M. I did however enjoy the stick figure puppet show used to explain the story. Controlling R feels fine most of the time, except when you need to do anything precise. These difficulties are often compounded by an unsteady camera that can often get in your way. 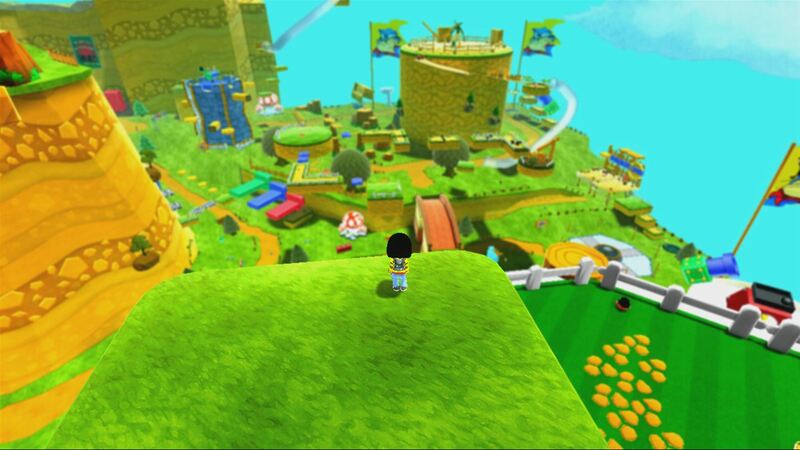 There were plenty of times when I needed to make multiple short jumps and just couldn’t get a fluid feel to the movement of R. This doesn’t make the game unplayable by any means but it’s important to know that you will need to exercise patience during the precise platforming portions. R has many similar moves as Mario such as double jump, diving, sliding, cartwheel jumps, etc. In fact, I swear one of her exclamations sounds exactly like the Italian plumber himself. I also noticed that R would grab some ledges and pull herself up, but wouldn’t grab others; making me second guess and retry some of my traversal routes. 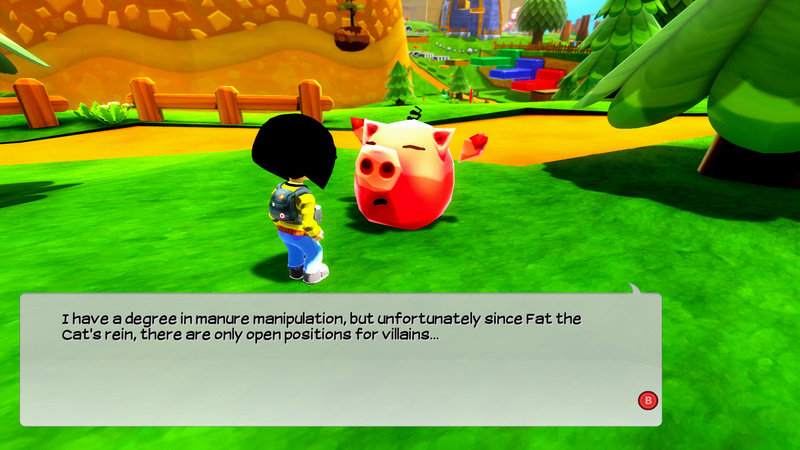 There are also a few small things that felt odd for me: controlling the camera and interacting with NPCs and menus. Controlling the camera with the default settings felt really odd to me, thankfully the game allows you to invert the horizontal and vertical axis’. Even with my desired settings, controlling the camera felt very jittery and imprecise. Finally, a small gripe I have is the choice to appoint the B button as your interact button and to continue all text conversations. Every fiber in my being wants to press the A button for these moments. The graphics and sound in FreezeMe are not going to impress anyone much. 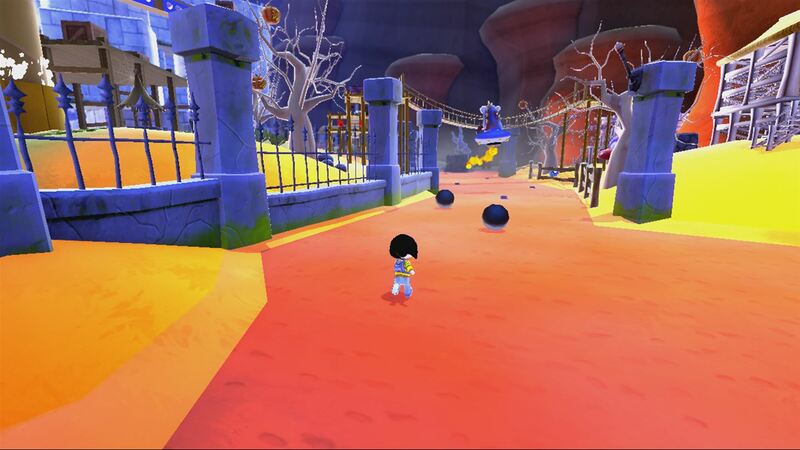 While the game is bright and colorful, it lacks many details and just looks a little flat. None of that really bothered me when I started to sink my teeth into a new level. There is much freedom in every level and plenty of areas on the ground and in the air to explore. That’s really where the game’s strengths lie, it’s level design and freedom to complete objectives in any order. Every new area made me feel like a kid turned loose in the toy store, so much to see and do in an overwhelming but fun way. Every level has about 10 objectives to complete and before you start a short cutscene gives you a glimpse of where you are supposed to go. After that its up to you to fight every urge to not get sidetracked, complete the objective and earn a golden cube. The game loads fairly quickly and I never noticed any slowdown or graphical issues. I did find it odd how every time I snapped back from the achievement app, I would have to sign in to my profile again. This was very annoying as many of the achievements in FreezeMe are based on completing something a number of times, so I always liked having the window snapped to view my progress. 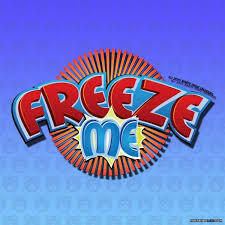 Maybe I look at a game like FreezeMe through nostalgia goggles, because for all its shortcomings I really enjoy playing it. There is so much to see and do in each level that the buggy camera or sensitive controls never held me back. I think this game will really appeal to two types of gamers: those who grew up in the glory days of the Nintendo 64 and really young gamers, those under 8 years old. Anyone else will either not feel nostalgic or completely dismiss it for looking childish. Those willing to give it a chance will find an affordable 3d platformer with lots to do and a very kind achievement list.